Motor learning is the study of how we learn (or acquire) motor skills. Understanding motor learning is important for individuals involved in instructing or teaching movement skills, such as physical education teachers, primary education teachers, coaches, and exercise scientists. 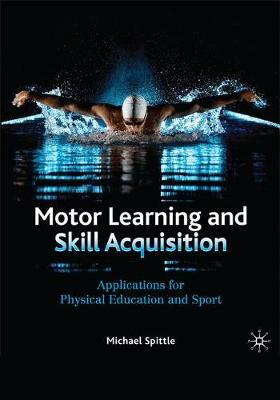 The book is organised to initially provide a general understanding of what motor learning is and some important variables related to understanding learning in sport and physical education. Once the student understands what learning is and some factors that can influence learning, the topic of motor control is introduced. Understanding how we control movement is important as a basis for understanding how to develop approaches for teaching and coaching. If an instructor understands how someone produces a movement, they will be much better equipped to be able to help a learner to actually do it. So, once the student understands what learning is and how movement is controlled, the textbook explores how the learning environment can be manipulated to assist in learning and performing movement skills in physical education and sport. The textbook is novel in its aims of: emphasising how motor learning has application specifically in physical education and exercise and sport science; providing an Australian 'feel' to the study of motor learning; providing a structure geared to the needs of students and lecturers in an Australian context; and targeting the appropriate level of content for undergraduate students to encourage engagement with the material.